Breast imaging subspecialists and general radiologists who interpret breast images should adhere to the unique lexicon of the American College of Radiology Breast Imaging Reporting and Data System Atlas (ACR BI-RADS®). The atlas was designed to ensure that breast findings are appropriately analyzed and correctly designated to one of seven BI-RADS categories, each of which implies a specific management recommendation. BI-RADS 3 was created to help reduce the number of false-positive biopsies, while maintaining a high rate of early cancer detection. Five major studies from 1987 to 2001 helped establish that BI-RADS 3 lesions have ≤2% chance of malignancy.1-5 Understanding when it is appropriate to place a finding into the BI-RADS 3 category is essential for radiologists interpreting diagnostic mammograms and ultrasounds. A BI-RADS 3 category should only be given after a complete diagnostic work-up, which may include additional mammographic views and often sonographic evaluation. BI-RADS 3 is strongly discouraged as a final assessment from a screening mammogram. Finally, BI-RADS 3 is not to be used as a category of uncertainty and should not be used as a safety net to place findings that a radiologist is unsure whether to pass as benign or biopsy. focal asymmetry without associated calcifications or architectural distortion. architectural distortion thought to be due to postsurgical scar. 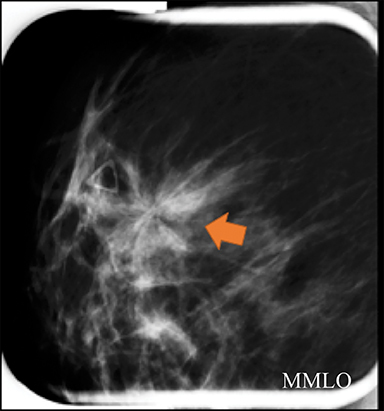 A screening mammogram performed on an asymptomatic 60-year-old woman demonstrated grouped round and amorphous calcifications in the upper outer quadrant of the left breast. An associated focal asymmetry was noted to be stable for several years. The screening exam was assessed BI-RADS 0, with recommendation for additional evaluation with magnification views. Magnification views (Figure 1A) demonstrated grouped round and amorphous calcifications, with a final assessment of BI-RADS 3, probably benign and short-term follow-up in 6 months recommended. 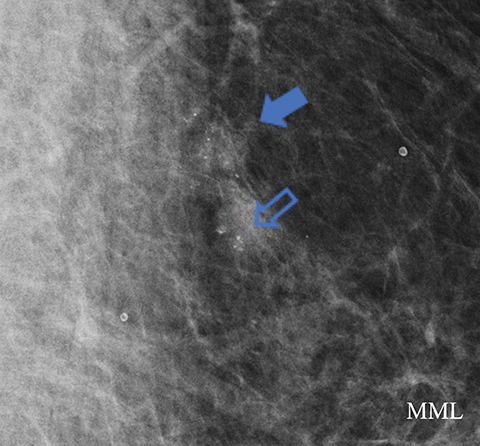 The 6-month follow-up diagnostic mammogram (Figure 1B) showed unchanged, but persistent, grouped round and amorphous calcifications, and the diagnosis was upgraded to BI-RADS 4A, low suspicion for malignancy, with biopsy recommended. Stereotactic biopsy was performed and pathology returned ductal carcinoma in situ. In this case, amorphous and new round calcifications were present. A solitary group of round calcifications can be assessed BI-RADS 3 after complete diagnostic evaluation when initially seen on a baseline mammogram or without prior exams for comparison,6 but new round calcifications and amorphous calcifications do not meet these criteria. The presence of new calcifications initially should have prompted biopsy. Furthermore, assessment of microcalcifications should be based on the most worrisome morphology or distribution, and it is the most suspicious finding which should prompt action.6 The positive predictive value (PPV) of malignancy for amorphous calcifications is approximately 20%, based on review of multiple single-institution consecutive-case series,6 and this exceeds the maximum 2% chance of malignancy that defines the BI-RADS 3 category. Although round calcifications on a baseline may meet criteria for category 3 assessment, the presence of new round or amorphous calcifications merit a BI-RADS 4 assessment with recommendation for biopsy as the most appropriate next course of action. This case exemplifies the importance of calcification morphology and ascribing the appropriate BI-RADS assessment. 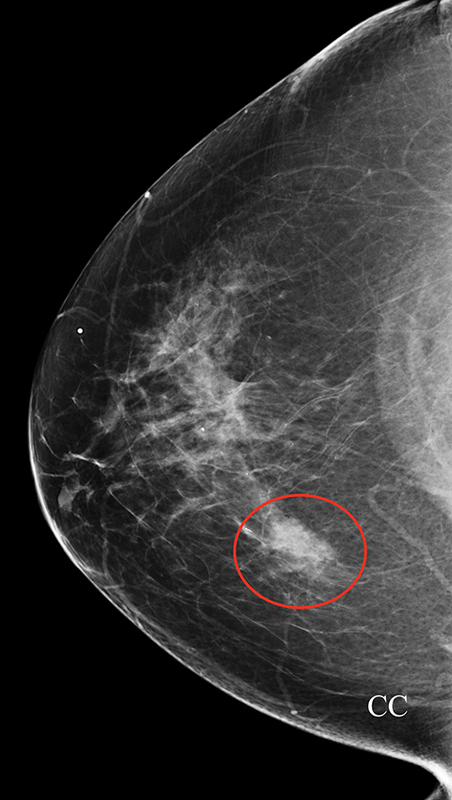 A problematic, well-known reality in breast imaging is interobserver variability when describing microcalcifications.10 To account for this, it is essential for the interpreting radiologist to re-evaluate all follow-up studies, as well as the initial study, to ensure appropriate BI-RADS assessment. The radiologist who interpreted the 6-month follow-up exam in this case correctly acted on the finding of amorphous microcalcifications with recommendation for biopsy. A screening mammogram on an asymptomatic 80-year-old woman demonstrated a new one view asymmetry in the lateral right breast (Figure 2A). The screening exam was assessed BI-RADS 0, with additional evaluation requested. At diagnostic follow-up, a magnified CC view was performed in which the asymmetry, although low density, did not efface. 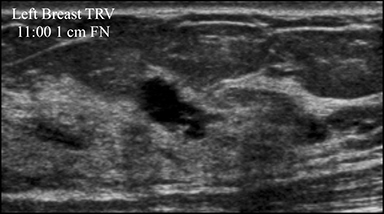 Sonographic evaluation of the entire lateral right breast was normal. The final assessment from the diagnostic work-up was BI-RADS 3, probably benign, with short-term follow-up in 6 months recommended. 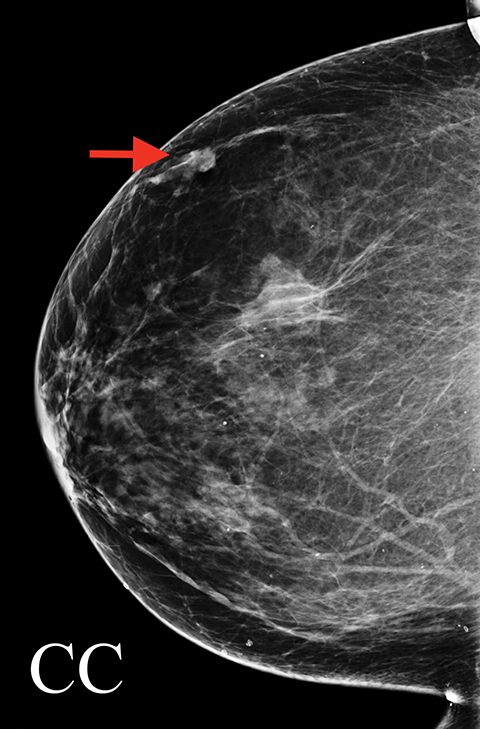 The follow-up diagnostic mammogram (Figure 2B) showed the one-view asymmetry had increased in density. On repeat ultrasound (Figure 2C), an irregular indistinct and microlobulated mass was identified, and the BI-RADS score was upgraded to 4B, with biopsy recommended. Ultrasound-guided core biopsy pathology returned invasive mucinous carcinoma. 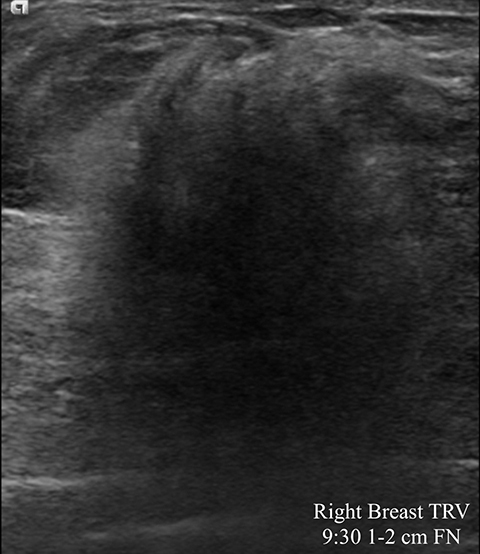 A 66-year-old asymptomatic woman presented for baseline screening mammography, which demonstrated a one-view asymmetry in the medial right breast (Figure 3A). The exam was assessed a BI-RADS 0 for additional evaluation. The diagnostic spot magnification view showed the asymmetry persisted, but ultrasound evaluation was negative. The diagnostic study was assessed a BI-RADS 0, with recommendation for further evaluation with MRI. The patient’s insurance company denied the MRI, so an addendum was made to change the BI-RADS assessment to 3, with recommendation for short-term follow-up. The 6-month follow-up diagnostic exam (Figure 3B) demonstrated the medial asymmetry had enlarged and was now identified on two views. 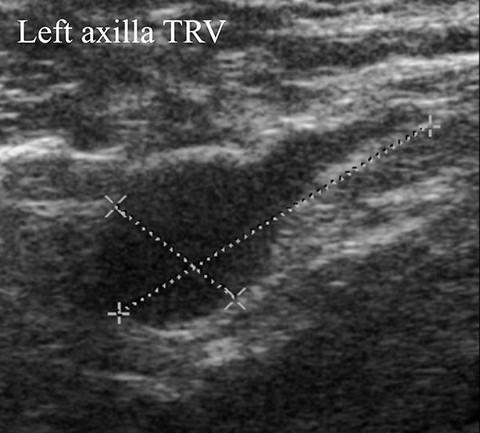 Sonographic evaluation at follow-up demonstrated a 3-cm irregular, spiculated mass (Figure 3C). The BI-RADS assessment was upgraded to 5, highly suggestive of malignancy. The patient subsequently underwent ultrasound guided core biopsy, which revealed invasive lobular carcinoma. Any asymmetry seen on a baseline screening mammogram, or an exam without comparisons that is confirmed with diagnostic mammography and is without ultrasound correlate, can be considered for short-term follow-up, stereotactic biopsy, or surgical excision.15 These three options are quite different, and the final recommendation partly depends on the radiologist’s level of suspicion and experience. In this case, attention to suspicious changes at follow-up led to the correct assessment and a BI-RADS upgrade, with recommendation for biopsy. 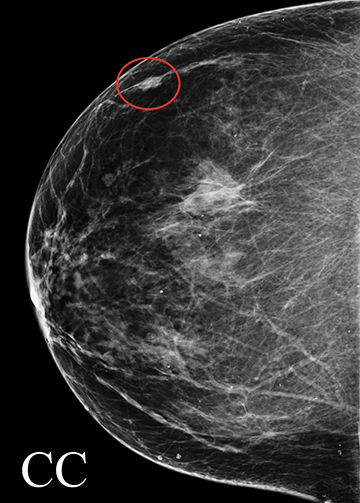 This case also illustrates why the BI-RADS® Atlas specifically cautions against assigning diagnostic breast imaging exams a final BI-RADS assessment of 0 for the recommendation of additional imaging with breast MRI.6 A breast MRI may be recommended and can be helpful in evaluating difficult one-view findings.16 However, the recommended MRI may never be performed due to insurance or financial restrictions, contraindications related to renal disease, or implanted foreign devices among other reasons. Furthermore, the MRI may not resolve or aid clarification of the finding. For these reasons, the interpreting radiologist should issue a final BI-RADS assessment to the diagnostic mammogram or ultrasound. 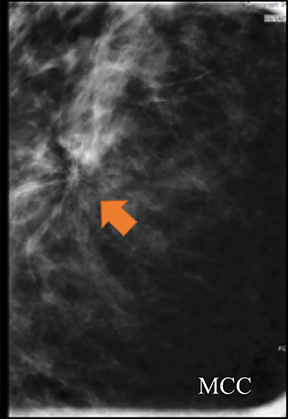 A screening mammogram performed on a 45-year-old asymptomatic woman showed an area of architectural distortion in the right breast near 12 o’clock, for which BI-RADS assessment 0 was made for additional imaging. Spot magnification views (Figure 4A) showed persistent architectural distortion with no sonographic correlate, and the finding was assessed BI-RADS 3, probably benign, with short-term follow-up recommended. 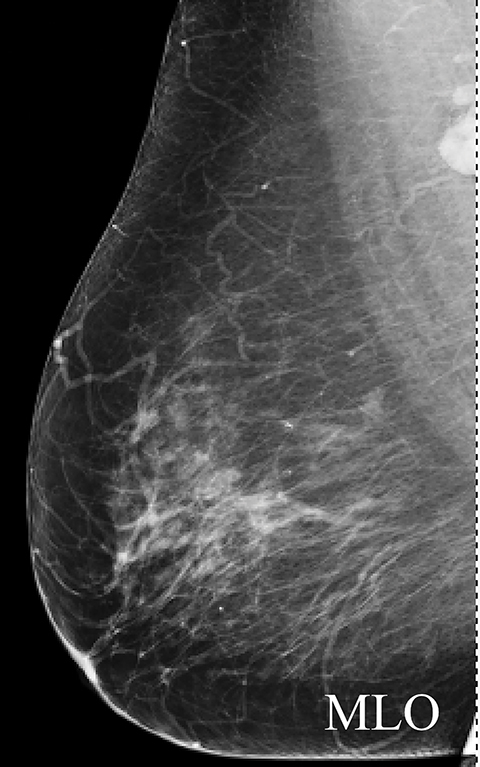 The follow-up diagnostic mammogram (Figure 4B) showed a persistent, but stable area of architectural distortion at 12 o’clock, again without a sonographic correlate. Final BI-RADS assessment of 4C, high suspicion for malignancy, was made with surgical excision recommended. Pathology returned a complex sclerosing lesion. Although the architectural distortion was stable at short-term follow-up, the interpreting radiologist made the most correct decision to biopsy the finding as this patient had no history of breast surgery. Architectural distortion is the third-most common mammographic manifestation of nonpalpable breast cancer and accounts for 12-45% of missed breast cancers.15-17 Partyka et al showed that digital breast tomosynthesis makes subtle findings of architectural distortion more conspicuous and increases detection when used as an adjunct as part of the screening mammogram.17 This is especially advantageous due to the high PPV of malignancy reported for architectural distortion that is tomosynthesis-detected, but sonographically occult.18 Architectural distortion can only be considered for BI-RADS 3 short-term follow-up when there is history compatible with a surgical scar. A 39-year-old woman presented with a palpable area of concern in the left breast. 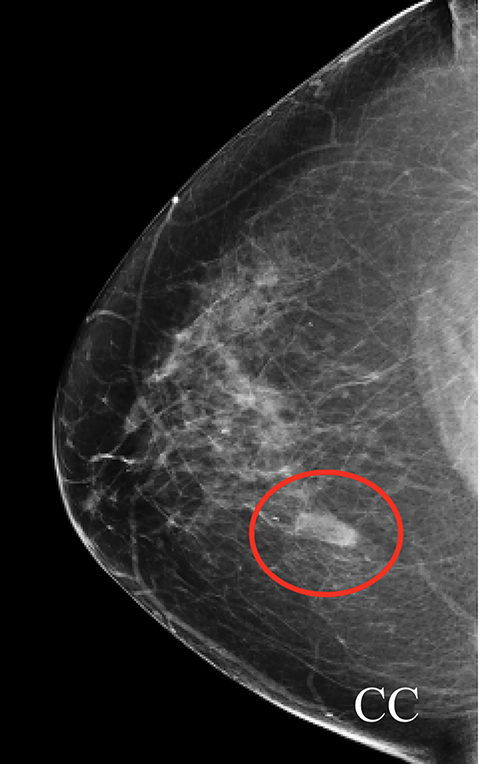 There was no mammographic correlate, but a small mass on ultrasound (Figure 5A) correlated with the palpable area. This 7-mm correlative mass was characterized as oval and non-circumscribed, was assigned BI-RADS category 3, and short-term follow-up was recommended. Follow-up ultrasound (Figures 5B) showed a 2-cm irregular mass with microlobulated and angular margins. Additionally, a left axillary lymph node with eccentric cortical thickening was identified (Figure 5C). The final BI-RADS assessment was upgraded to 5, highly suggestive of malignancy, with biopsy recommended. 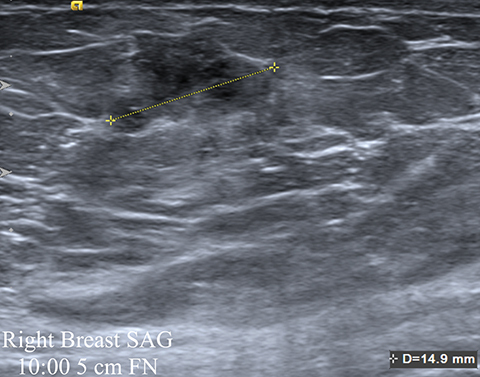 Ultrasound-guided core biopsy of the mass was performed, with pathology returning invasive ductal carcinoma and metastatic involvement of the axillary lymph node. Multiple studies have found that short-term follow-up is an appropriate alternative to immediate biopsy for palpable masses demonstrating probably benign imaging features, as they show an acceptably low incidence of malignancy.19-23 However, strict adherence to BI-RADS category 3 criteria is crucial to avoiding a delay in cancer diagnosis. Many BI-RADS 3 lesions are diagnostically challenging cases. A BI-RADS 3 final assessment should not be given for a screening exam. Category 3 is reserved for cases only after a complete diagnostic imaging work-up has been performed and the finding has been shown to meet probably benign criteria. 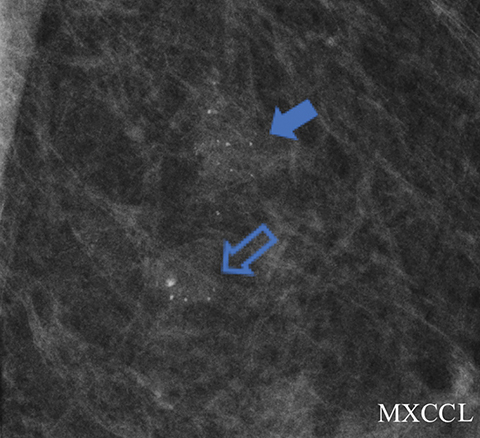 During breast imaging interpretation, it is paramount to remember that the BI-RADS 3 category is not an across-the-board catch-all in which to place nonspecific imaging findings. When faced with a difficult imaging scenario in which one may consider placing a finding into this follow-up category, reviewing BI-RADS 3 criteria can provide insight. Additionally, the ACR Appropriateness Criteria® can offer direction to radiologists faced with a difficult case. As shown in these examples, zealous attention to detail is required at follow-up, as one should reconsider the appropriateness of the initial BI-RADS 3 assessment while concurrently searching for suspicious changes or new suspicious findings. Sickles EA. 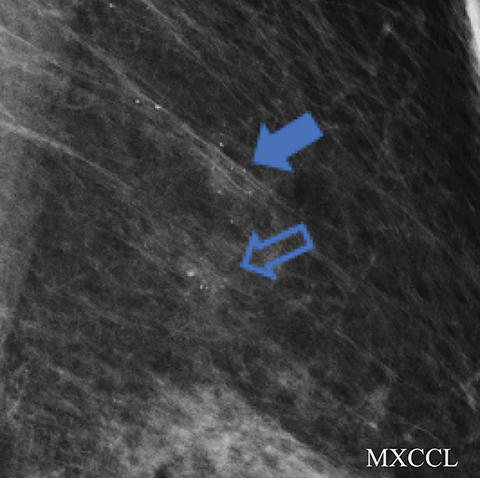 Periodic mammographic follow-up of probably benign lesions: results in 3,184 consecutive cases. Radiology. 1991;179(2):463-468. Wolfe JN, Buck KA, Salane M, et al. Xeroradiography of the breast: overview of 21,057 consecutive cases. Radiology. 1987;165(2):305-311. Helvie MA, Pennes DR, Rebner M, et al. Mammographic follow-up of low-suspicion lesions: compliance rate and diagnostic yield. Radiology. 1991;178(1):155-158. Varas X, Leborgne F, Leborgne JH. 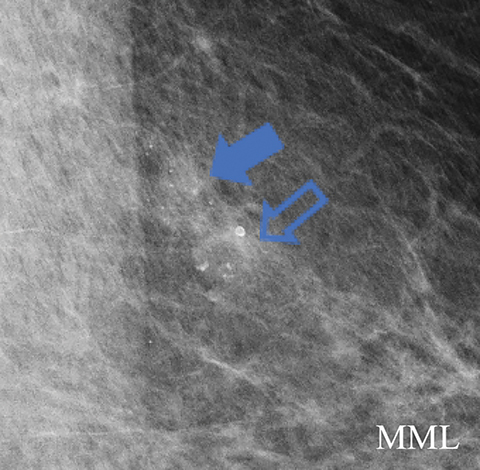 Nonpalpable, probably benign lesions: role of follow-up mammography. Radiology. 1992;184(2):409-414. Vizcaíno I, Gadea L, Andreo L, et al. 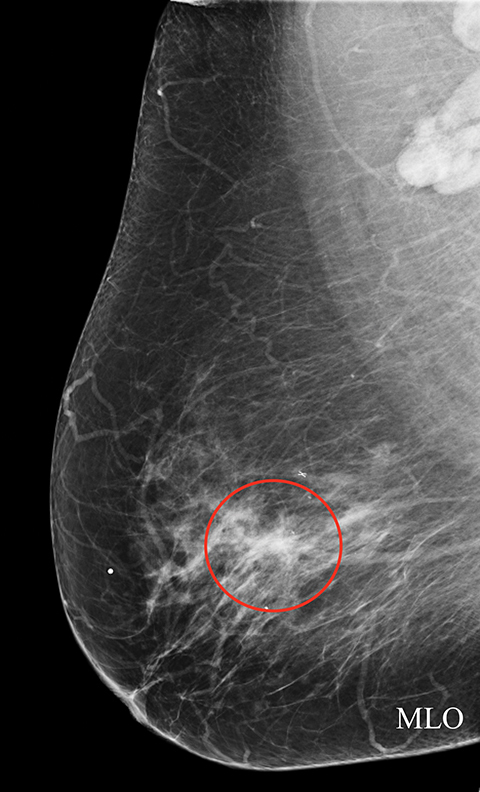 Short-term follow-up results in 795 nonpalpable probably benign lesions detected at screening mammography. Radiology. 2001;219(2):475-483. D’Orsi CJ, Sickles EA, Mendelson EB, et al. ACR BI-RADS® Atlas: Breast Imaging Reporting and Data System. 5th ed. Reston, VA: American College of Radiology; 2013. Burnside ES, Sickles EA, Bassett LW, et al. The ACR BI-RADS® experience: learning from history. J Am Coll Radiol. 2009;6(12):851-860. Sickles EA. Findings at mammographic screening on only one standard projection: outcomes analysis. Radiology. 1998;208(2):471-475. Varas X, Leborgne JH, Leborgne F, et al. Revisiting the mammographic follow-up of BI-RADS category 3 lesions. AJR Am J Roentgenol. 2002;179(3):691-695. Adibelli ZH, Ergenc R, Oztekin O, et al. Observer variability of the breast imaging reporting and data system (BI-RADS) lexicon for mammography. Breast Care. 2010;5(1):11-16. Youk JH, Kim E-K, Ko KH, et al. Asymmetric mammographic findings based on the fourth edition of BI-RADS: types, evaluation, and management. RadioGraphics. 2009;29(1). Chesebro AL, Winkler NS, Birdwell RL, et al. 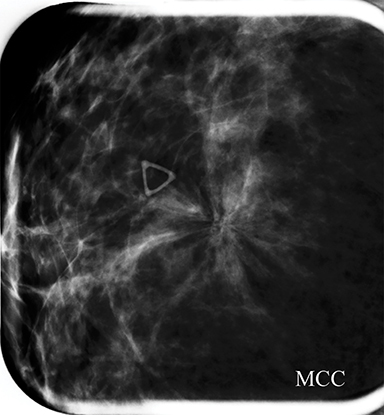 Developing asymmetries at mammography: A multimodality approach to assessment and management. RadioGraphics. 2016;36(2):322-334. Price ER, Joe BN, Sickles EA. The developing asymmetry: Revisiting a perceptual and diagnostic challenge. Radiology. 2015;274(3):642-651. Peppard HR, Nicholson BE, Rochman CM, et al. 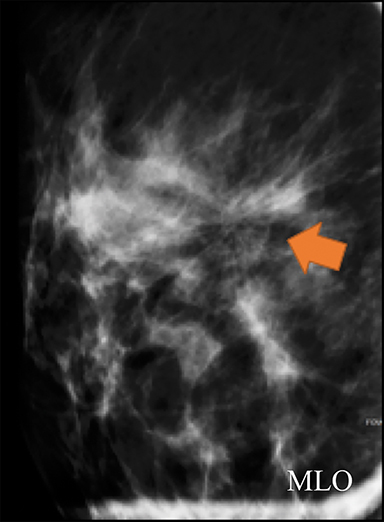 Digital breast tomosynthesis in the diagnostic setting: indications and clinical applications. RadioGraphics. 2015;35(4):975-990. Newell MS, Birdwell RL, Dorsi CJ, et al. ACR Appropriateness Criteria® on nonpalpable mammographic findings (excluding calcifications). J Am Coll Radiol. 2010;7(12):920-930. Moy L, Elias K, Patel V, et al. Is breast MRI helpful in the evaluation of inconclusive mammographic findings? AJR Am J Roentgenol. 2009;193(4):986-993. Partyka L, Lourenco AP, Mainiero MB. Detection of mammographically occult architectural distortion on digital breast tomosynthesis screening: Initial clinical experience. AJR Am J Roentgenol. 2014;203(1):216-222. Freer PE, Niell B, Rafferty EA. 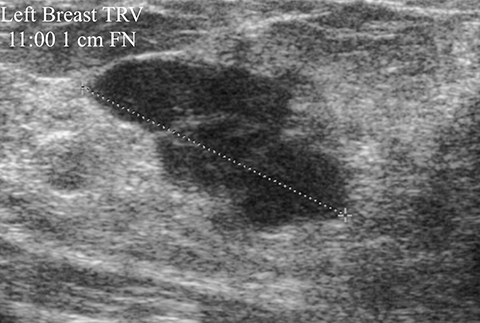 Preoperative tomosynthesis-guided needle localization of mammographically and sonographically occult breast lesions. Radiology. 2015;275(2):377-383. Harvey JA, Nicholson BT, Lorusso AP, et al. Short-term follow-up of palpable breast lesions with benign imaging features: evaluation of 375 lesions in 320 women. AJR Am J Roentgenol. 2009;193(6):1723-1730. Graf O, Helbich TH, Fuchsjaeger MH, et al. Follow-up of palpable circumscribed noncalcified solid breast masses at mammography and US: Can biopsy be averted? Radiology. 2004;233(3):850-856. Sickles EA. Probably benign breast lesions: when should follow-up be recommended and what is the optimal follow-up protocol? Radiology. 1999;213(1):11-14. Graf O, Helbich TH, Hopf G, et al. Probably benign breast Masses at US: Is follow-up an acceptable alternative to biopsy? Radiology. 2007;244(1):87-93. Sickles EA. Probably benign breast nodules: Follow-up of all cases requires initial full problem-solving imaging. Radiology. 1995;194(2):305-306. Messinger J, Crawford S, Roland L, Mizuguchi S. Inappropriate use of BI-RADS Category 3: Learning from mistakes. Appl Radiol. 2019;48(1):28-33. Dr. Messinger is a Breast Imaging Fellow at Mallinckrodt Institute of Radiology at Washington University School of Medicine, St. Louis, MO; and Dr. Crawford, an Assistant Professor, Dr. Roland, an Associate Professor, and Dr. Mizuguchi, an Assistant Professor of Radiology, at the University of Louisville School of Medicine, Louisville, KY. This article is based on Mizuguchi S, Crawford S, Roland L, Messinger J. Inappropriate use of BI-RADS Category 3: ‘An Expert is a Person Who Has Made All the Mistakes That Can be Made in a Very Narrow Field.’ -Niels Bohr. Radiological Society of North America 2016 Scientific Assembly and Annual Meeting, November 27 – December 2, 2016, Chicago, IL. No financial resources were used in the preparation and performance of this study. Appropriate IRB approval was obtained for this retrospective clinical paper.